Could Cena actually take on Becky Lynch someday? Once upon a time, inter-gender matches were quite commonplace in WWE. It's a new era where violence upon women, even in kayfabe, is frowned upon, and hence, inter-gender matches are few and far between these days. This did not stop WWE from teasing a John Cena vs. Becky Lynch confrontation down the line. The caption even said- 'never say never', getting fans excited for the dream duel. Believe it or not, Becky Lynch and James Ellsworth did take each other on in an inter-gender match, not long ago. While such was the contest on paper, it was booked in such a manner that Lynch got all the offense in. Inter-gender matches are quite common in the independents. Lucha Underground is a TV program that books many contests between men and women, where both competitors are booked in a competitive manner. 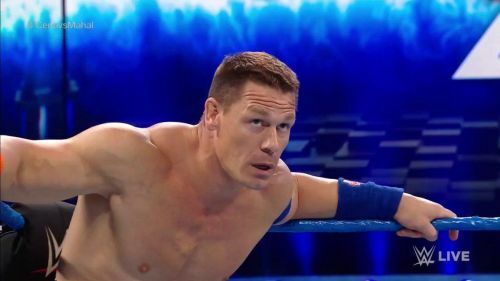 John Cena and Becky Lynch teamed up on SmackDown Live last week against Andrade 'Cien' Almas and Zelina Vega, but Lynch ended up tossing Cena out of the ring at the tail end of the match. In my opinion, this match will not play out in the current era. It's just WWE teasing us about what could be. I love inter-gender matches and would have certainly loved to see this contest. Should WWE allow inter-gender matches in the future? What do our readers think?